Albert Henry Parham was born in Gloucester in 1877, the son of a nailmaker, who died when Bert was aged only 13, and his mother became a laundress. The family lived in Prince Street, Barton St Mary, Gloucester. Aged 24 in 1901, Bert was still living with his mother, and was employed as a wireman, railway telegraphs. By this time, Bert, who was 5ft 10½in tall, and weighed 12st 12lb, had started to play rugby for Gloucester. He had started his rugby playing career with Barnwood, but his talent came to the attention of Gloucester and he was invited to play for the A team, his first appearance being against Lydney on 1st October 1898. He played eight games for Gloucester A, and gained his chance to break into first-class rugby when the Gloucester half-back, Dicky Goddard was injured. Bert was selected to make his debut for the first team, under the captaincy of Walter Taylor, at Coventry on 7th January 1899, a game which Gloucester won 8-0. The following week, he retained his place and travelled to Llanelly, where Gloucester recorded their first ever win, 6-3, at Stradey Park. When news of this victory filtered back to Gloucester, a large crowd gathered at the Cross to celebrate, and when the team arrived back by train at Gloucester station at midnight, they were greeted by a brass band, and the players were carried shoulder-high through the city. What a start to Bert’s first class career. Bert had made such an immediate impact that he was selected for all the remaining 1st XV matches for the reminder of the season. His first appearance at Kingsholm was in the 8-0 win against Bath on 28th January 1899. His first try for Gloucester was scored at Kingsholm on 18th February 1899, and won the game 5-3 against Cardiff. Later in the season, he also scored against Ashford House. By the end of the season he had made 17 appearances, and had tasted defeat only twice. In his summary of the season in the Citizen, Bill Bailey commented that “Parham was very successful in the matches with Welsh teams” and “proved far more effective with his feet than with his hands, a style of play which paid very well in several games, but was not always the best policy”. 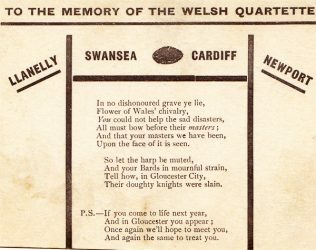 This was the season when Gloucester achieved the unique distinction amongst English clubs of beating all four of the big Welsh clubs (Swansea, Cardiff, Newport and Llanelly), and Bert played in all of these matches. 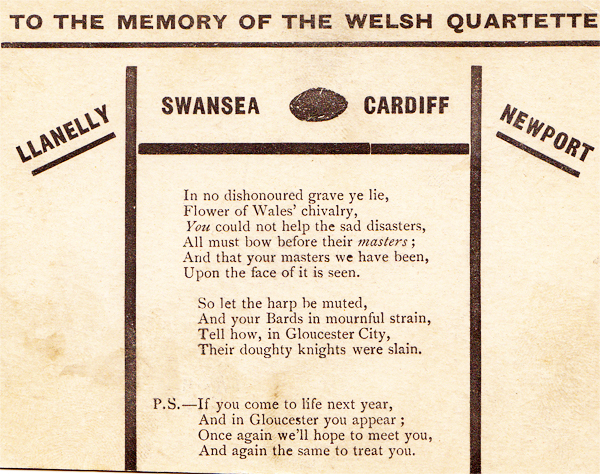 Commiseration cards for the demise of each of the Welsh clubs were produced – originals of these have survived and are now displayed in the Cathedral View bar at Kingsholm. Despite this early success, for the next two seasons, with Dicky Goddard and George Hall available at half-back, Bert dropped out of the first team. In 1899-1900, he played regularly for the A team (in 20 of the 24 fixtures) and was comfortably the top try scorer with 11, but made only 3 appearances for the 1st XV. Bill Bailey considered the selection of Goddard and Hall as first choice half-backs to be correct, but clearly felt Bert was unfortunate to miss out, describing him as “good enough for almost any company”. Reacting to the limited opportunities to play at half-back, in 1901-2 Bert re-invented himself as a forward. He started the season in the A team, scoring against Bream and Cardiff A, but then broke into the first team again, and appeared regularly in the pack thereafter. He figured in 21 of the 1st XV’s 34 fixtures, scoring tries in the second half of the season against Clifton, Lydney, Stroud and London Welsh. Bill Bailey noted that “one or two players (notably Click and Parham) have proved very effective in loose rushes” and “Parham and Jewell clearly established their claims to regular places in the team”. WB was certainly right about that – in the next 6 seasons Bert was an ever present in the first team, playing in 191 out of 209 fixtures, and his scoring rate improved too, as he ran in 43 tries over the same period. He developed into a clever dribbler a smart player in the open, proved able to hold his own with the best of forwards, and became a power to be reckoned with. In 1902-03, he led the list with 33 appearances (out of 36 matches), and was second highest try scorer with 8 (behind “Whacker” Smith). He scored in 3 successive matches, starting with the traditional Boxing Day match against Old Merchant Taylors, and continuing against Cheltenham and Coventry; he also scored both home and away against Bath. George Hall had by now ceased to play, and Bert was one of several players who stood in at half-back on occasion, but he was now regarded primarily as a forward, where he was reported by WB as “Parham, Westbury and Purton were a trio distinguished for splendid work in the open”. Bert appeared in 28 of the 34 fixtures played in 1903-04, and had another haul of 8 tries. WB reported that “Parham was entrusted with the leadership of the front division, and with Goulding, Hawker and G H Smith, formed a strong quartette”. This season also saw him playing county rugby for Gloucestershire. Bert again led the list of appearances for Gloucester in 1904-05, missing only one of the 36 fixtures, and although it took him until mid-December to register his first try of the season, he ended up with another 8 to add to his growing tally (but this in a season when Arthur Hudson scored 35 for the club). He again scored in the Boxing Day match against OMTs, and ran in two tries each against Clifton, Broughton Park on Good Friday, and Cinderford. He also scored against both Cheltenham and Stroud in county cup matches, and played against Bristol in the final, which was won 12-0, as a result of which Bert and his teammates were presented with gold medals by the County Union President, Mr Ball. Billy Johns had taken over as pack leader, but WB summarised Bert’s season as “Parham showed better form than ever”. In 1907-08, Bert made a further 30 appearances for Gloucester, missing only 4 games, and scoring 4 tries. He also forced his way back into the Gloucestershire side for the re-arranged match away in Redruth against Cornwall. Gloucestershire had travelled to Redruth two weeks previously, but the ground was too hard to play on. Three-quarters of the way through the match, Gloucestershire led 10-8, but they then collapsed and were routed, Cornwall scoring 6 tries in 20 minutes and winning 34-10. That was to be Bert’s last County Championship game. Bert married Julia Florence Bird in 1908. They set up home at 16, Herbert Street, Gloucester, and went on to have a son and two daughters. Bert played one final game for Gloucestershire in his last season, when the County took on Racing Club de France at Kingsholm on 24th December 1908. Bert also had the distinction of scoring a try in the 39-0 victory. Bert finished his Gloucester playing career with 264 appearances over 11 seasons, scoring 55 tries and 165 points. He died in Gloucester in 1953, age 76. Bert’s nephew, William George Parham, also played as a forward for Gloucester. He made 36 appearances, 1912-14 (and a further 15 appearances for the A team). In 1913-14, he played in 35 of the 37 fixtures (more than any other player), and WB commented that “ a recruit to the pack who came into prominence was W Parham, a sound scrummager whose good work was apt to be overlooked through not being seen a lot in the open.” William signed up with the Gloucestershire Regiment in the World War One, and was killed in action on 4th October 1917, aged 25, at Broodseinde in the Ypres Salient. William’s son, Robert made 3 appearances for Gloucester, two in 1945-46 and one in 1948-49.